M2400-3-10CS $7295.00 wireless top of jack load cell system including laptop computer. 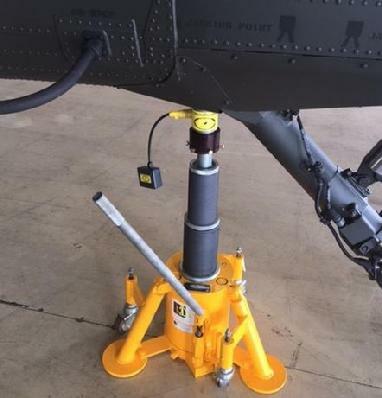 Three 10,000lb wireless cells, laptop computer, digital indication via USB, one inch mounting, 30,000lbs total system capacity, digital indication. Wireless weighing is easy and fast, no more wires to deal with while weighing your aircraft, airplane or helicopter. 150 ft range, 2.4 ghz transmission, USB computer link antenna displays the scale readings right on the laptop computer which is supplied. This system runs on laptop power so your battery life is only limited to your computer capability which is 3+ hours currently. Load cells are powered by standard AA batteries that are available anywhere. The life span on the batteries is currently 1+ years and they are updated at the time of calibration. Wireless operation, reads out on the supplied laptop computer, software pre-loaded, calibrated and ready to use. Wireles cells with transmitters allow for easy use and alingment for signal strength. Our laptop read out can display in visual MAP mode as shown or can read out as a digital indicator right on the laptop screen in real-time. 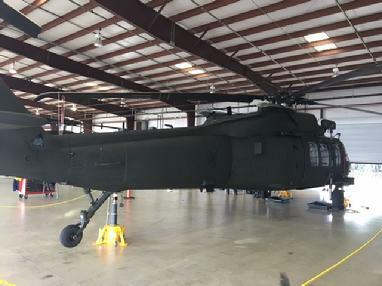 We can provide custom applications for airlines and MRO operations, software can be configured for advance math functions, CG, Gravity correction, images can be added and company logos can be used for the read outs and print outs. 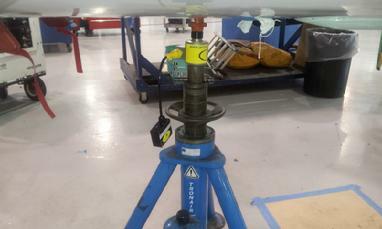 Standard cell mounting on a typical tronair jack with one inch receiver hole. Units mount on standard jack rams with one inch mounting hole as shown. Check your jacks for the mounting hole by removing the cup and checking for the hole. If you do not have the removable cups, then jack adapters will be required which are optional. We have other sizes of load cell kits avaialbe in the wireless format, including our new wireless platform series! Our cell kits start out at 5,000lb per cell and go up to 100,000lb per cell.